Is Your Air Conditioner the Reason You Can’t Stop Sneezing? Home » General Health » Is Your Air Conditioner the Reason You Can’t Stop Sneezing? The dog days of summer are long and hot. And normally, I’d love it, but last weekend I was sofa-bound due to a minor surgery. Forced to spend the weekend inside my top floor apartment with the sun beating down. Thankfully, I had the air conditioner fired up. I’m sure you know just how essential an air conditioner is in the summer. But, while it can provide some cool, comforting relief from the heat, it can also lead to a runny nose, congestion, and uncontrollable sneezing. So, if you’ve been dusting and cleaning your house nonstop and trying to get to the bottom of your breathing troubles, you might want to consider focusing some attention on your trusted air conditioner. Your air conditioner may be causing your sneezing fits, congestion, and sniffles. And, it’s probably the last place you’d look. But the reality is that cold air and dusty filters can send your sinuses into a tailspin. It might be the last thing you want to consider not even a week into August. But, think about what happens when you step outside on a cold winter day—your nose starts running, and you’re sniffling all the way down the street. Well, the same thing can happen when you walk into a cool, dry room. So, if you find your nose dripping uncontrollably when you turn on your air conditioner or walk in from outside, it’s likely because the cold air has triggered a natural nervous system response causing your nasal membranes to produce mucus. If you have allergies, it may be particularly pronounced. It’s generally nothing to worry about, as the symptoms should subside quickly. But, if they don’t, and you find yourself becoming increasingly congested, it could be that your air conditioner is flooding your space with poor-quality air. It’s likely that your air conditioner is circulating tiny particles like pollen, dust mites, mold spores, and other pollutants that have become trapped inside it. This can have quite a big impact on your allergies and breathing, as I can certainly attest to. My neighborhood is under heavy construction, so my air filters get dirty very quickly. Although bacteria and air pollutants might not result in “allergic reactions,” they can irritate the nose. Mold spores and dust mites, on the other hand, can result in long-lasting allergic reactions. Mold spores can actually become trapped in the filter of your air conditioner, so each time it’s turned on, tainted air is filling your room. If that’s the case, do your best to clean or change the air filter regularly to keep these allergens out of your space. 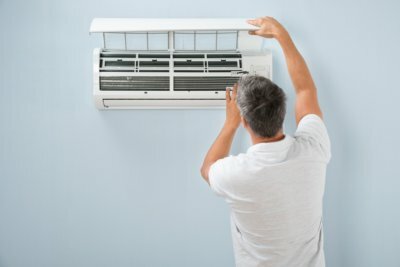 Most modern air conditioners have filters that can be easily removed and cleaned, so consult your unit’s instruction manual on how to get at yours. Hopefully, this advice helps you breathe a little easier when you find yourself indoors this summer! Weintraub, K., “Can Air-Conditioners Cause Sinus Congestion?” The New York Times, June 2, 2017; https://www.nytimes.com/2017/06/02/well/live/can-air-conditioners-cause-sinus-congestion.html?_r=0, last accessed July 31, 2017.